What is lithium? Why is lithium used in batteries? How does lithium affect the environment? Most people don’t know much about the batteries that power their devices. Don’t you want to know more about the battery on your phone? Today, you’re going to learn all about lithium-ion batteries. The lithium in your rechargeable batteries comes from one of two places. The first is from mines in Tibet and China. The best known is the Ganzizhou Rongda Lithium mine. Here, miners extract lithium from the mountains. The second place we get lithium from is the Salar de Uyuni in Bolivia. Salar de Uyuni is the world’s biggest salt flat. Corporations pump brine to the surface. It sits over a period of months as the water evaporates, leaving behind lithium rich salt. This process is water intensive – using 500,000 gallons per tonne of lithium. This is a huge social and environmental problem. 65% of the area’s water is used in this form of lithium mining. Many local communities have to get their water shipped in from other resources. Batteries don’t actually store electricity. In fact, electricity can’t be stored. Instead, batteries work by converting chemical energy into electrical energy. Lithium-ion batteries are made up of an anode, a cathode, a solvent, and a barrier. The anode and cathode are at opposite ends of the battery. They pull electrons through the barrier separating the anode and cathode. These electrons cause a chemical reaction that produces electricity. When you charge your phone, the electrons are pulled back toward the anode. When it’s charged, the electrons are ready to make the trek toward the cathode again. To understand why we use lithium, we need to understand the perks of the lithium-ion battery. There are a lot of pros and a few cons to the lithium-ion battery. Let’s explore that. Compared to other batteries, lithium is lighter and holds way more energy. That means it’s easier to power phones and other items where weight and size are an issue. Most batteries lose a bit of their power during use. Lithium-ion batteries do too, but much less – only about 5% in the first month and 2% per charge after that. Many batteries need to be primed before their first use. That’s not the case with lithium-ion. Charge it up all the way and it’s ready to roll! Lithium-ion is versatile. It can be used in something as small as a vape-pen to something as big as a car. It has seemingly-endless potential uses. Lithium-ion batteries are pretty fragile when it comes to the way they’re charged. Overcharging damages them, and you don’t want to use too strong or too weak of a current. This is all handled by a mini computer and special circuitry. The user never has to worry about it. Ah aging, the boon of us all. Whether they’re used or not, lithium-ion batteries tend to go bad after 2-3 years. After that, they need replacing. This is taxing enough in a smartphone, but even worse when it comes to an electric car. Lithium-ion is expensive – about 40% more expensive than nickel-cadmium cells. You all remember when Samsung had to recall Note 7? There was an issue with the Lithium-ion batteries. It spontaneously caused the Notes to explode. The vast majority of the time, these batteries are totally safe. But a lithium-ion laptop battery holds as much energy as a hand grenade. How Do Lithium-Ion Batteries Affect the Environment? There are two main concerns when considering lithium-ion batteries and the environment. The first is what happens when we extract lithium from the world around us. The second is how does lithium affect the world when it is disposed of. We’ll look at both of those next. As we mentioned above, lithium comes from China, or it comes from the world’s largest salt flat in Bolivia. Neither of these is great for the environment. On several occasions, locals in small towns next to the Liqi river found dead fish filling the river. They talked about the horrendous smell. They said that hundreds of yak and oxen died from drinking the contaminated water. In their protest, the government temporarily shut down the Ganzizhou Rongda Lithium mine. They promised to address the environmental concerns before allowing the mines to reopen. But this didn’t happen. Within a few months, the rivers were full of dead fish again. The locals said the river used to be full of healthy, thriving fish. Now there are few. As mentioned above, the area surrounding the Salar de Uyuni struggles to get fresh water. Many villages have water transported in from other areas. 65% of the water available is used to make brine in the salt flats. From there, the water is channeled into shallow pools where it sits and evaporates for months on end. It leaves a lithium-rich salt behind. It’s used because it’s efficient, easy, and cost-effective. This process has disastrous effects on the locals who struggle to find fresh water. Furthermore, it’s marring the landscape, leaving huge ruts and unnatural formations. What Happens When My Phone Dies? What happens to your lithium-ion batteries when they’ve outlived their lives? You may be able to recycle them, but in the UK less than 3% of phones were actually recycled. And if they are recycled, there’s not much that we can do with them. The lithium is worn out, and it can’t be put into a new phone. Many of the processes used to melt down the metals end up destroying the lithium as is. Nonetheless, recycling is still better than throwing them in the landfill. Batteries that end up in the landfill leach toxic chemicals into the ground. From there, they get washed up into streams, and eventually into the ocean. Crops grown near landfills pick up the toxic chemicals from the ground. The toxins end up in your food. Lithium-ion is especially bad, due to the explosive tendencies. When the cartridge starts to wear down, lithium-ion batteries can explode. They start fires that are hard to control. Smoke from the fires and the toxins are leached into the air. This all contributes to the world’s greenhouse gasses and to global warming. For better or worse, lithium-ion batteries are a part of our lives now. Still, there are a few things you can do. Even if we can’t reuse the materials, recycling keeps these toxins out of our landfills. Using reusable batteries will cut back on how many batteries you dispose of every year. 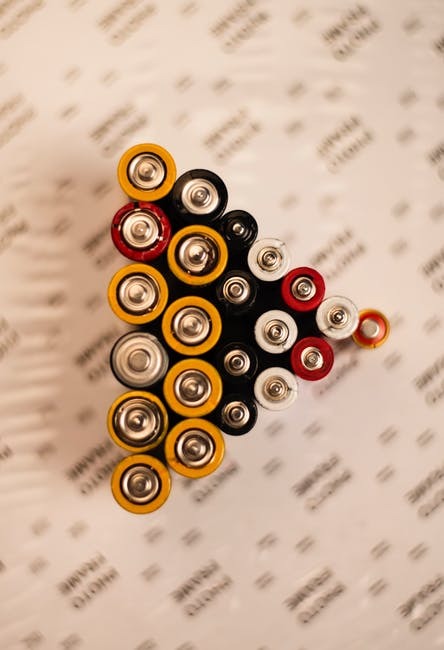 Consider these useful tips next time you think about buying batteries. If you have the option between batteries or no batteries, opt for the battery-free option. We can’t completely cut batteries out of our lives, but any place you can cut back help. If you can opt for energy saving options elsewhere in your life. Solar energy is becoming more affordable and viable for the every-day American. It looks like the lithium-ion battery is here to stay for a while. But the scientist that can come up with a better battery is going to go down in history. There’s a ton of research in the battery field right now. When the time comes, consider investing in more environmentally friendly options. For example, this scientist is looking to build a carbon-based battery out of cotton – of all things! We understand why lithium is used in batteries, even if we don’t like it. But for the time being, it still remains the most environmentally friendly battery. Do what you can to cut back on your battery consumption and take care of your electronics. This will help cut your carbon footprint when it comes to batteries. Curious about other energy options? Have you learned how geothermal energy could be the next big thing?